Imagine you have a blog piece, an article for your employee newsletter or even a long report that you’ve been procrastinating over. How do you persuade yourself to sit down and actually write it? The classic advice is to break your job into a bunch of smaller tasks. Simply identify smaller sections and do one at a time. This can be highly effective, but imagine that the subject you need to write about just doesn’t interest you and even these teeny tiny sections make you quiver with boredom. What can you do? Understand that interest is not something you have or don’t have. It’s the result of an ACTION. So, you should take the action you need in order to generate interest. This might mean talking to others to find out what’s interesting about the topic you need to write about and why it’s important or useful to others. 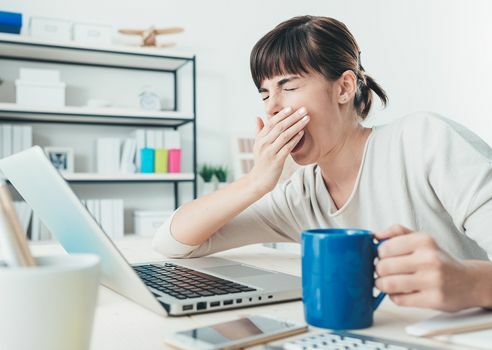 Did you know that yawning is contagious? Well, so is enthusiasm. Go out and catch some. Put yourself in someone else’s shoes. I have never seen a sporting event that interested me (apart from the soccer games my daughter played — and even that was a stretch.) But I can put myself in the shoes of sports fans, just as I hope they can put themselves in MY shoes as a theatre enthusiast. If you’re truly not interested in a subject try to find someone who is and approach your story from that person’s perspective. My husband likes watching tennis, soccer and some hockey so if I ever have to write a story about sports, I know I can speak with him. Watch your negative self-talk. We all talk to ourselves all the time. Psychologists call this “inner speech” and many forms of psychotherapy involve teaching people how to replace negative self-talk with more positive inner messages. Whenever you’re writing something that you think bores you, pay particular attention to negative chatter such as: “I hate writing this. This is so boring. I wish I could do anything” The difficulty with saying these things to yourself is that they’re likely to become self-fulfilling. You say them, so you believe them. Not helpful! Tell yourself ‘I LOVE doing this.’ This sentiment may be completely untrue, but simply saying it to yourself serves a surprisingly sensible purpose: It gives you a more positive attitude, it helps you get started (most tasks are never as bad as we fear), it helps create a positive, self-sustaining cycle and it allows you to expand your thinking. Plan your time. Many people resist planning, especially for tasks they dislike or find boring. But planning can allow you to contain a job you don’t find interesting. Work always expands to fill available time (Parkinson’s Law) so by limiting your time you can reassure yourself that even if you don’t enjoy a task very much (notice how I framed that more positively than “not at all”), it won’t take up too much of your time. Use music. While I typically dislike listening to music while writing (I keep wanting to sing along with the words) I think it’s a great thing to do just before Music can be uplifting, energizing and inspiring; it can also change our mood and improve our motivation. As well, there is some evidence that certain types of music can help writers. Understand that emotions are integral to writing. I read an interesting excerpt last week from the book Emotions, Learning and the Brain by Mary Helen Immordino-Yang. In her book, she argues that it’s neurobiologically impossible to build memories, engage complex thoughts, or make meaningful decisions without emotion. “We feel social relationships and appreciate intellectual achievements using the same brain systems that sense and regulate our guts and viscera, adjust our blood chemistry and hormones, and conjure our awareness and consciousness,” she writes. “No wonder our creations, reputations, cultural ideals, and personal relationships, including those in educational contexts, have such amazing psychological power.” Her core argument is that emotions are integral to education, but I argue that they’re equally important for writing. It’s important not to ignore your emotions — especially not such important ones as deep boredom or a vast lack of enthusiasm. Instead, your job as a writer is to find a way to develop an interest in your topic. Above all, remember that if you are bored when you’re writing, your readers will surely be bored when they’re reading. How do you get yourself more interested in a topic you need to write about? We can all learn from each other so, please, share your thoughts with my readers and me in the “comments” section below. Anyone who comments on today’s post (or any others) by Oct. 31/16 will be put in a draw for a copy of the novel Circling the Sun by Paula McLain. Please, scroll down to the comments, directly underneath the “related posts” links, below. Note that you don’t have to join the commenting software to post. See here to learn how to post as a guest.